Feel like you're coming unhinged? Then it's time to slap on the Narthex bracelet or Narthex Belt Buckle and do a naked crazy dance. Okay, that's just a little something I like to do, but you really should buy one of these stylish accessories. 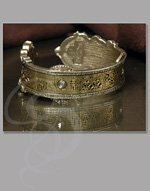 Both the bracelet and buckle are reproductions of a ginormous hinge from a medieval church door. The bracelet curves gracefully around the wrist and demands attention and (with any luck) kneeling and prayer at your feet. 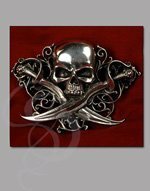 The buckle sits squarely on your .. uh waist so that people can find religion on your pelvis. 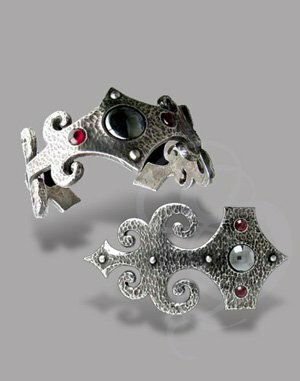 Both the bracelet and buckle are made from hammered pewter with hematine and garnet cabochons inset. But but what does Narthex mean? I hear you whine. Well, Narthex is the entranceway to a church or cathedral, you big baby. Happy now? No? That's because you're still here reading this description instead of clicking on the Add to Cart button. Now hurry along before some priest buys all these up to replace the hinges on tiny church doors across Europe. 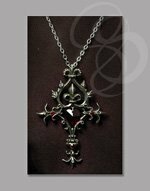 Materials: Fine English Pewter inset with Hematine and Garnet Cabochon Stones.